• CREST syndrome and diffuse cutaneous systemic sclerosis are the primary manifestations of systemic sclerosis. 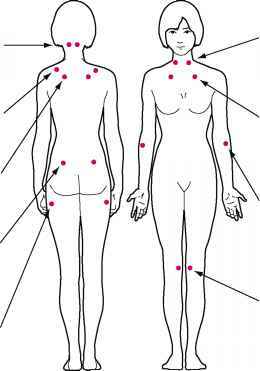 • Female/male predominance is 8:1 for sclerosis. • The major ACR criterion for systemic sclerosis is skin thickening proximal to the MCP and MTP joints. "Scleroderma," or hardening of the skin, is now recognized to be a disorder involving almost every organ system in the body and is therefore more appropriately referred to as systemic sclerosis. Systemic sclerosis is characterized by a progressive fibrosis of the skin, blood vessels, lungs, kidneys, heart, and GI tract. The degree of skin involvement (diffuse or limited) is useful for prognosis. Diffuse cutaneous systemic sclerosis (DCSS) involves almost the entire body, including the trunk, face, neck, and extremities. Cardiopulmonary disease is the leading cause of death in DCSS. Limited cutaneous systemic sclerosis has a more benign course and involves the face, neck, and distal extremities below the knee and elbow. CREST syndrome (calcinosis, Raynaud's phenomenon, esophageal dysmotility, sclerodactyly, and telangiectasias) is one of the limited forms of systemic sclerosis, characterized by cutaneous thickening of the distal limbs only. Skin biopsy showing subcutaneous fibrosis is helpful if the diagnosis is in doubt. Systemic sclerosis affects women up to eight times more often than men; peak incidence is in the 40s and 50s. There is no significant familial connection, but systemic sclerosis patients typically have a family history of autoimmune disease. Many chemicals and toxins have been implicated, most clearly silica exposure in coal miners. The major ACR classification criterion for systemic sclerosis is skin thickening proximal to the MCP or MTP joints. The three minor ACR criteria are involvement distal to the MCP joints (sclerodactyly), fingertip-pitting scars or loss of subcutaneous tissue, and chronic pulmonary interstitial changes. Patients with the major criterion or two of the three minor criteria are considered to have systemic sclerosis; however, many patients with clear-cut systemic sclerosis do not meet these criteria because their disease might be early or undif-ferentiated or in an overlap category with other connective tissue diseases. Ninety-five percent of patients have a positive ANA test result, most often nucleolar staining. Various sero-logic tests, including anti-RNA polymerase, anticentromere antibody, and antifibrillarin, can provide prognostic information. The vast majority (>90%) of systemic sclerosis patients have Raynaud's phenomenon, which is the initial complaint in most patients, although some might complain first of puffy hands and fingers and of arthralgias. Raynaud's patients experience cold hands and feet, usually triggered by cold temperature or emotional stress. Vasospasm of the digital arteries and arterioles causes skin pallor, followed by cyanosis. With rewarming, the digits have a hyperemic or red color, thus completing this white, blue, and red phenomenon. Scleroderma's skin changes result from inflammation and subsequent collagen deposition. The skin feels (and is) thickened, with decreased flexibility. As the skin becomes more fibrotic and thickened, it becomes very dry, causing pruritus. Late-stage skin changes include atrophy. Arthralgias and myalgias progress to muscle atrophy and weakness. Scleroderma patients can develop two different pulmonary diseases, pulmonary hypertension and pulmonary fibrosis. Pulmonary hypertension (which can occur independently of fibrosis) is associated with a poor prognosis. Gastrointestinal symptoms include dysphagia with heartburn, dry mucosal membranes, esophageal reflux, and dys-motility. Cardiac manifestations are usually late and caused by coronary vasospasm, myocardial fibrosis, and pericardial effusions. antidepressants. Thyroid fibrosis might lead to hypothyroidism; sicca syndrome can be treated with artificial tears and good dental care. Treatment for systemic sclerosis is difficult. Penicillamine, immunosuppressive drugs, and other agents have been used to treat scleroderma, but none has yielded dramatic results. Localized sclerosis can soften with ultraviolet-A (UVA) light therapy, with dramatic improvement in symptoms seen in two small, non-RCTs (Kreuter et al., 2004; Stege et al., 1997). Other options include high-dose topical corticosteroids and methotrexate. Treatments for calcinosis, including proben-ecid, colchicine, and warfarin, have not shown improvement. A five-patient study showed that the calcium channel blocker (CCB) diltiazem caused significant regression in calcinosis and clinical improvement (Palmieri et al., 1995); more studies are needed. Raynaud's phenomenon is treated by cold avoidance for the entire body (not only hands), tobacco avoidance, and biofeedback or other stress reduction techniques; phar-macologic therapy includes CCBs, topical nitroglycerin, and prazosin (Pope et al., 2004). A meta-analysis concluded that CCBs are efficacious for reduction in frequency and severity of attacks (Thompson et al., 2005). Skin care consists of avoiding excessive bathing and using moisturizers. The NSAIDs are used first for musculoskeletal symptoms of systemic sclerosis, but low-dose corticosteroids or narcotic analgesics might be needed. No studies have been performed, but in general, acid-reducing medications such as PPIs or H2 blockers are used to prevent the development of possible esophageal strictures, given the high rates of esophageal dysmotility in the systemic sclerosis. Delayed small intestinal tract transit time may lead to bacterial overgrowth, causing GI symptoms; antibiotics might be effective. Angiotensin-converting enzyme (ACE) inhibitors are useful in the treatment of renal crisis manifested by hypertension and renal failure. For scleroderma-like disorders, see the discussion online at www.expertconsult.com.